IBM offers a wide variety of data warehousing and analytic solutions enabling the best approach for each situation. From traditional multidimensional and data mining to mashups and industry models, IBM has the right solution for gleaning insight from information. One of our inaugural IBM Champions, Lester Knutsen, summed up his Informix work in a single sentence: “I like building databases.” While working at Aberdeen Proving Ground in 1983, one of the first Unix boxes arrived, bundled with Informix – and Lester marveled at how quickly he could get into it. Starting with user requirements, the team loads the data and builds a prototype that lets clients “kick the tires” and see how their data actually works within the warehouse. Clients are often surprised at what they find in the prototype. For the first time, they can identify their biggest customers or find missing transactions. Even more important, though, is the ability to change direction as clients have “aha” moments about their data. Sometimes, seeing the prototype in action inspires an even better idea. Besides building databases, Lester and his team spend a lot of time helping clients navigate an ever-changing regulatory environment. While regulations are important, Lester has noticed that some very large organizations use them as “an excuse not to get things done.” These organizations often lack a truly cooperative team or a clear mission. In contrast, Lester is proud of his team, noting he’s built, “the best pool of Informix talent in the world, outside of IBM.” The team includes two additional IBM Champions, Cindy Lichtenauer and Art Kagel, with whom we did a follow-up interview. (Stay tuned.) Lester firmly believes that, “Good people attract good people,” and he’s committed to developing talent. Advanced DataTools has a unique internship program for high school seniors and college students who show promise in technology. Several participants have come to work for Advanced DataTools after graduation. Through it all, Lester tries to foster an environment that’s “fun, interesting and challenging.” His team works hard, but they also list their passions on the company’s website. In Lester’s case, he travels extensively to scuba dive and take underwater photos and videos. You can view his incredible collection at http://www.lesterknutsen.com. Currently, he’s using his database skills to organize his growing video library before heading to Indonesia this summer. During our recent interview with International Informix User Group (IIUG) president Stuart Litel, he shared the best-kept secret about Informix. Working with Informix since the mid-1980s, Stuart is well-qualified to share such secrets. But we’ll get to that in a bit. Stuart first encountered Informix when he was hired by Sheraton to replace the worldwide Sheraton reservation service. During testing, the team discovered that “this thing called Informix” worked best. Overnight, Sheraton became the world’s largest non-governmental user of Informix. IBM’s 2001 acquisition of Informix changed the game, adding resources that have made Informix even more stable and useful. Stuart points to the prevalence of releases offering new features as a huge reason that users choose – and stick with – Informix. As president of IIUG, Stuart spoke highly of the users, saying, “The people who use it are a testament to the product.” He’s currently very busy preparing for the April IIUG Conference, which will be the biggest ever, and the first time the conference will be in San Diego. Stuart praised the host hotel’s wifi – it even works by the pool – and food. But more importantly, the larger hotel will allow for more sessions. Organizers have added two educational tracks, bringing the total to seven tracks with over 80 sessions. Stuart is especially enthusiastic about David Barnes’ keynote on Big Data. David is Program Director, Strategy and Emerging Technologies with IBM. Join Stuart and IIUG April 22-25 in San Diego for the IIUG Conference. While you’re there, get certified and attend the hands-on labs. A special thanks to all our Business Partners who were a part of this video, for making it a very special and successful one for Informix. Informix Warehouse Accelerator: A Year in Perspective: Customers have many technology choices that can accelerate their data warehouses. This session will examine technology trends, discuss why customers choose Informix Warehouse Accelerator (IWA), present customer use cases, review applications and summarize lessons learned across a diverse set of customer adoptions. BOF – Achieving High Availability and Scalability Across Heterogeneous Environments: Exchange challenges, strategies and success stories during these informal discussions over lunch. BOF – Enabling Cost Effective Applications that use Interval (Time Series) or Spatial Data Types: Exchange challenges, strategies and success stories during these informal discussions over lunch. Hands-On With Informix 11.70: New Features Can Be Implemented Wherever Appropriate: Attend this session to experience the many new futures that have been introduced in Informix 11.70. These features are designed to enhance the core strengths of Informix: high availability, reliability, scale out, ease of use, simple administration, security and performance. Informix Warehouse Accelerator: Billion Rows Benchmark Demo: After one year of using the Informix Warehouse Accelerator there is considerable evidence of its amazingly fast performance. In one set of benchmarks it took 14 minutes to run queries that used to take 9 hours. This session will demonstrate current benchmarks with this exciting new database technology. It will include a demonstration of ad-hoc queries on a bookstore database with 250 million customer records and over a billion sales transaction records in the fact table. Attend this session and learn how to achieve very fast performance with your data warehouse. How Informix Clustering Technology Helps European Retailer NKD to Improve Operations and Reduce Costs: NKD is a rapidly-growing fashion retailer with roughly 1700 stores in central Europe. This presentation will show how NKD is able to use Informix to fulfill its growing availability and scalability demands. The session will explain how a cost-conscious retailer like NKD was able to move to a new Informix version on Linux, thereby improving its IT operation while reducing costs at the same time. The NKD solution combines state-of-the-art hardware technology such as SSDs with new Informix features. For instance, NKD has implemented high availability with a shared disk cluster that allowed them to reduce failover time to just a few seconds. Informix in the Cloud: Businesses are embracing the virtualization and automation of cloud computing to help decrease costs and increase the efficiency of their IT departments. Informix offers time-tested characteristics such as stability, low cost of administration and performance, in addition to recent new features. This combination makes Informix an excellent choice for cloud computing applications. Attend this session to explore how a business implementing a private cloud could benefit from Informix Flexible Grid. Attendees will also hear about the new Informix Hypervisor Edition and what it can mean for cloud computing. IBM Informix Innovations: Where We Are and Where We Are Going: Come to this session to hear the Director of Informix Development talk about how the latest Informix innovations are helping Informix win new clients and partners across industries. You will also hear how Informix is uniquely positioned with a critical role among the IBM solutions for big data. The discussion will include a glimpse of the Informix roadmap and strategy that will continue to enable smarter solutions. 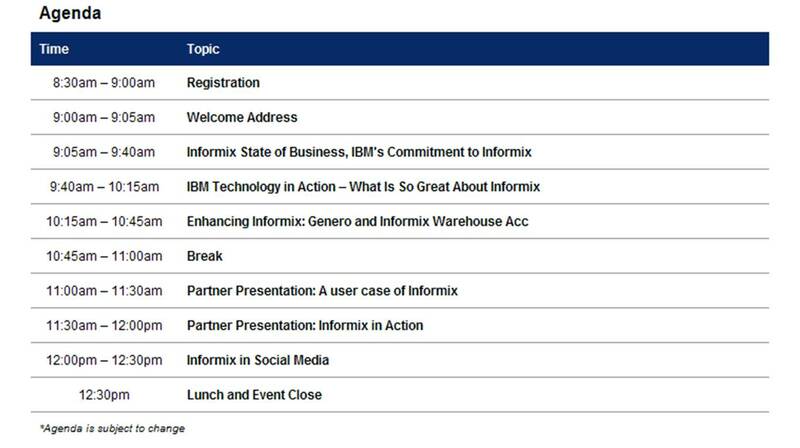 Hands-On With Informix Warehouse Accelerator: In March 2011 IBM introduced market-changing data warehouse technology that dramatically enhanced the ability of Informix to operate as a data warehouse or data analysis server. The accelerator technology uses compression and a columnar approach to storing and accessing data in-memory, as opposed to the row-based approach of most database engines. The IBM approach is designed to provide data response times that are hundreds of times faster than those achieved with conventional systems. In this lab, you will have the opportunity to use this technology. BOF – Informix Application Development: Exchange challenges, strategies and success stories during these informal discussions over lunch. BOF – Accelerating Data Warehouses with Informix: Exchange challenges, strategies and success stories during these informal discussions over lunch. Accelerating Data Life Cycle Management With Informix Warehouse Accelerator and Intel Xeon: IWA works with a snapshot of the data in Informix data mart. Once you have defined the data mart on IWA and loaded the data, you need to periodically refresh the data. You can choose to refresh all of the data or just the partitions that were added, dropped or modified. Whether you have hundreds of gigabytes or many terabytes, faster refresh will help you analyze recent data more rapidly and get closer to real-time business. This session will explain the options for data refresh, review their performance and explain how to correctly implement a refresh plan. IBM and Intel will demonstrate live data refresh on the Intel Xeon platform and examine the impact on performance. Informix 11.7 Performance Landscape: This session will present a detailed overview of Informix 11.7 performance, including new features, tuning and monitoring options, and best practices. Rapid Application Development With Informix Genero: Additional Benefits for New Applications: You have heard about the benefits of Informix Genero for modernizing 4GL, but what about using Genero for new application development? Genero provides all of the expected benefits of developing in a 4th-generation language, including simple constructs for working with your Informix database. This session explores the capabilities of the Genero graphical development environment, and how it streamlines the development process.If you are developing new apps for mobile, web or the desktop, Informix Genero should be on your shortlist. Modernizing 4GL Applications and Providing Web Services Using IBM Informix Genero: The lab will give users an understanding of IBM Informix Genero. Attendees will learn how to modernize existing 4GL applications with minimal user interaction. They will also see how Informix Genero is designed to help you develop applications once, and then deploy them over the web, on mobile devices, on desktops and more. The session will present case studies ranging from simple to complex, and will also explain the IBM experience and best practices for using Informix Genero. Using Informix Warehouse Accelerator to Accelerate Data Warehousing at Westfleisch: Data warehouses, must simultaneously provide fast answers to user queries while maintaining a low total cost of ownership. This presentation shows how one of the top five meat marketers in Europe, Westfleisch, employed Informix Warehouse Accelerator (IWA) to achieve these two goals. The project followed a 2011 proof-of-concept and decision by Westfleisch to move their data warehouse to IWA. This session will describe how this task was performed and what lessons were learned. Informix TimeSeries and Informix Spatial: What are Database Extensions and How Can I Use Them? Informix includes support for special data types such as interval (time series) data and spatial data. Applications utilizing these data types are becoming increasingly popular across industries. This session will discuss several use scenarios and answer the kinds of questions that arise when considering special data types. How can existing applications be enhanced to use location data or interval data? How much work is involved? What will it cost? What should we think about when designing a new spatial or time series application? Finally, the discussion will address the extensibility of the Informix database. Pronto Xi, Informix and IBM Cognos 10 – Designing integrated ERP and real-time BI for Mid-Market: Pronto Software was the first ERP vendor globally to release a fully integrated package of ERP and Cognos 10 BI. We’ll discuss how it was done and how we leveraged the IBM Informix Database to provide simultaneous transactional and real time business intelligence in a single seamless environment. The World has moved from simple, static reporting to dynamic, real-time dashboards, widgets and reports. Learn how Pronto has integrated the three pillars of this solution: Pronto ERP application, IBM Informix and IBM Cognos BI from a technical,change management and market perspective to provide a world leading solution in the mid-market. Getting the Most From Informix Compression and Other Storage Optimization Features: To get the most out of Informix Storage, you should utilize exciting new features such as data compression and index compaction. If you understand how to optimize data and index storage, your disk drives essentially work for you. Attend this session to learn how these new features can help you reduce backup times, improve query performance and lower administration costs. Retail Management System With Embedded Informix Database: This session will discuss how the Avanti retail management system, with Informix as its underlying database, has helped many retail customers to implement a faster solution, save record maintenance costs and offer an easy-to-operate system. Accelerating Business Process Management with Informix 11.7: IBM BPM 7.5 has a process instance repository, but sometimes it is necessary to interact with an external database. The Maricopa County Attorney’s office has integrated BPM 7.5 with Informix 11.7 and found the performance to be substantially faster than what their prior system achieved. This session will explore why. Improving Performance With Query Rewrite and External Tables: This session will explore two areas of Informix that are important for achieving maximum performance: query rewrite and external tables. Attendees will learn various techniques for doing query rewrite and hear about its use in different customer environments. The session will also cover internals of external tables and why it is important to replace many existing tools. Attend this session to hear about the most important factors to consider when using external tables to make your environment better, faster and more efficient. Delivering True Offline Capabilities to Mobile Devices With IBM solidDB and Worklight: The prevalence of mobile devices presents a unique challenge for businesses to deliver their capabilities by fully engaging their users. The fidelity of application interaction on these devices becomes extremely important. This presentation will cover how you can achieve this fidelity for any mobile app developed by utilizing IBM solidDB and the first-class MEAP (mobile enterprise app platform), IBM Worklight. This session will also explore how you can maintain interaction fidelity for mobile apps while achieving true offline capabilities such as security, maximum storage, a familiar programming model and sync when connectivity is available. You will witness a real-world scenario of a mobile app built using Worklight and utilizing solidDB. The Informix Graphical OpenAdmin Tool for OATs: This session will help participants understand the capabilities and architecture of OAT, the OpenAdmin Tool for Informix. The discussion will include an overview of the capabilities of OAT, highlighting such features as replication, query tracing, storage optimization, performance history graphs, auto-update statistics and space management, along with many other capabilities. Best Practices for Embedding Informix in a Constrained Environment: One of the primary strengths of Informix is its hands-free administration. This means Informix is often the best choice for an embedded application. In this session, participants can learn about the best practices for embedding Informix in a constrained environment where resources are limited. Informix customers could also reduce their overall administration cost by taking advantage of features that make Informix embeddable.